A healthier indoor climate. Automatically. VELUX ACTIVE with NETATMO is the easy way to a healthier indoor climate. Smart sensors continuously monitor the temperature, humidity and CO2 levels in your home and open or close your skylights and blinds to create a healthier indoor climate. Sensor-based ventilation: Smart sensors continuously monitor temperature, humidity and CO2 levels and open or close your skylights accordingly. Stay in control: Use the VELUX ACTIVE app to operate your VELUX skylights and blinds from anywhere using your smartphone. Easy installation: VELUX ACTIVE indoor climate control can be installed without any professional help. Already have a solar powered or electric skylight? 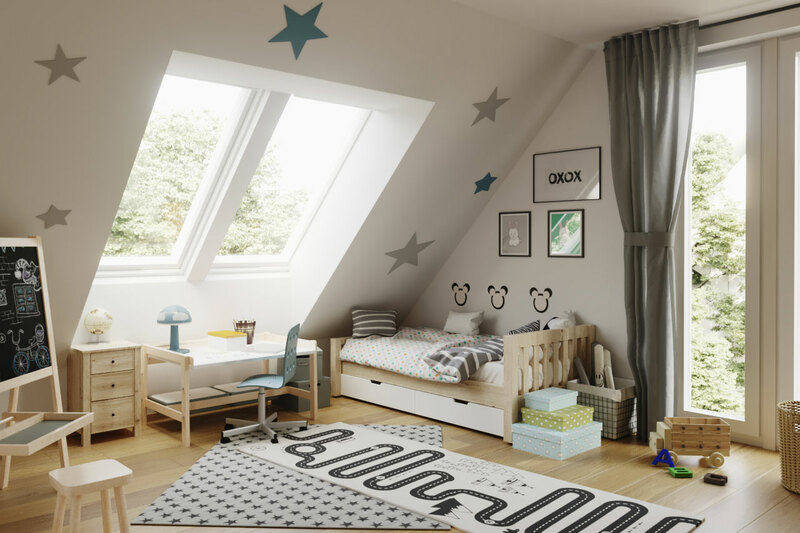 If you already have skylights, it's simple to add VELUX ACTIVE. Once you've gotten your kit and downloaded the app, you can connect them in 3 easy steps! VELUX Active is not compatible with skylights installed prior to 2010. The starter kit includes: one indoor climate sensor, one departure switch and one gateway. Both the starter kit and the smartphone app are required to install VELUX ACTIVE in your home. How can I get VELUX ACTIVE? What VELUX product is compatible with VELUX ACTIVE? Tap the departure switch on your way out to close your VELUX skylights. It is recommended to install one departure switch for each exit in your home. The indoor climate sensor continuously measures temperature, humidity and air quality (CO2 levels) in the room. Use the switch on the sensor to open and close your skylights. It is recommended to install one indoor climate sensor for each room with VELUX skylights. The gateway connects your VELUX solar-powered or electric products, indoor climate sensor and departure switch. It also connects to the internet via your Wi-Fi router to enable operation of your VELUX solar-powered or electric products from your smart phone. The gateway is included in the starter kit. Only one gateway is needed for each house or apartment. VELUX ACTIVE delivers a healthier indoor climate to you and your family – automatically. It works out of the box to regulate your indoor climate via smart sensors, and its accuracy gradually improves as it learns to understand the indoor climate of your home. Smart sensors continuously monitor temperature, humidity and CO2 levels and open or close your skylights to ensure a healthier indoor climate. Proactively ensures that the room is ventilated at least three times a day for a fresher, healthier indoor climate. Proactively closes your solar-powered blinds based on local weather forecast information to prevent overheating of the room. 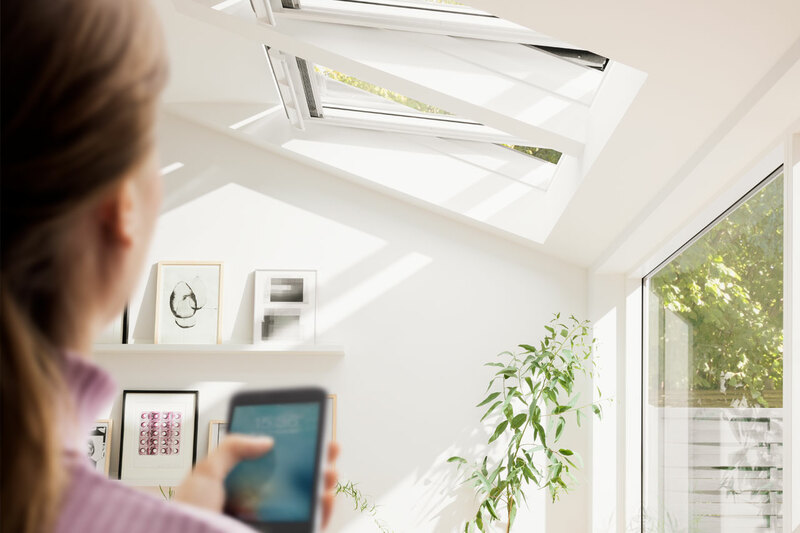 Use your mobile device to monitor your indoor climate and control the operation of your VELUX solar-powered or electric skylights and blinds from anywhere. VELUX ACTIVE smartphone app is required to connect to your electric or solar powered products. Get a quick overview of the indoor climate in all rooms and check if any windows are open. Pre-defined shortcuts for opening and closing all blinds for bright mornings and a good night’s sleep. Close your VELUX solar-powered or electric skylights with one touch and ventilate in the secured ventilation position. Offers the same functionality as the VELUX ACTIVE departure switch. Monitor temperature, humidity and CO2 levels in each room* to see if the indoor climate needs improving. 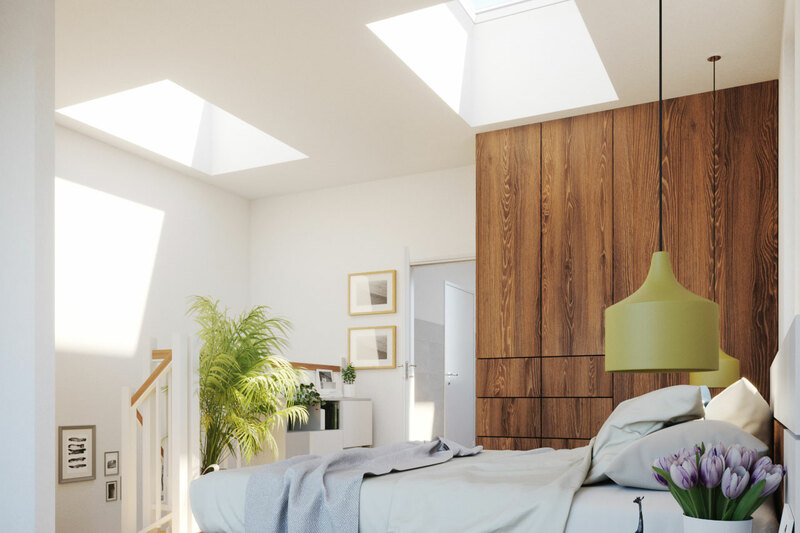 * Purchase additional VELUX ACTIVE indoor climate sensors to monitor additional rooms with VELUX solar-powered skylights (e.g. in kitchen, living room, bathroom, bedroom and children’s room). Open and close your VELUX solar-powered or electric skylights and blinds from anywhere. VELUX ACTIVE is Apple HomeKit compatible, letting you control your VELUX solar-powered or electric products and other smart home devices using voice control. Simply ask Siri to open your skylights or create the perfect mood for a cozy night at home. Say the word: Use voice control to operate your VELUX solar-powered or electric skylights and blinds. Set scenes with other Apple HomeKit accessories: Multiple smart home devices can work together with your VELUX ACTIVE indoor climate control. To install the starter kit, download the VELUX ACTIVE smartphone app, which will guide you through the four-step installation process. VELUX ACTIVE can be installed without any professional help. The VELUX ACTIVE app requires the VELUX ACTIVE starter kit. *iOS: VELUX ACTIVE with NETATMO requires an iPhone, iPad, or iPod touch with iOS 9.0 or later. Android: Requires Android 5.0 and higher with access to Google Play. 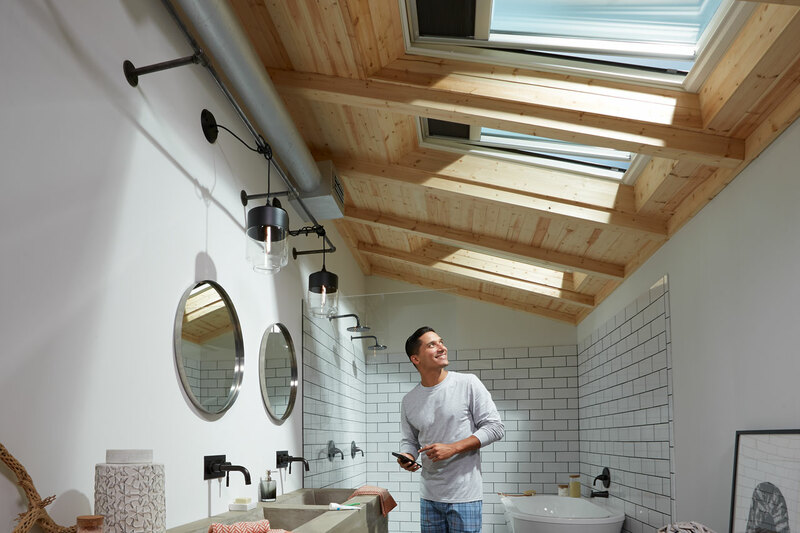 VELUX solar-powered or electric skylights and solar-powered blinds can be connected to VELUX ACTIVE indoor climate control. Check this quick guide to see if your products will be compatible. If you already have an VELUX solar-powered or electric skylights or solar-powered blinds with one of these remote controls (ref. KLR 200), your products are compatible with VELUX ACTIVE. If the remote control, wall switch, or type sign for your electric product has the io-homecontrol® logo, your products are compatible with VELUX ACTIVE. VELUX ACTIVE indoor climate control only works with VELUX solar-powered or electric skylights and solar-powered blinds. Explore the full selection of VELUX skylights. The VELUX Solar Powered "Fresh Air" Skylight is eligible for the 30% federal tax credit! Enjoy more daylight and fresh air in your home now. Add VELUX ACTIVE to monitor the temperature and air quality inside your home. The Electric "Fresh Air" skylight brings in abundant natural light and with the touch of a button, opens to let fresh air in. And if inclement weather is on the way and you're not at home, a rain sensor will automatically close the skylight for you. Add VELUX ACTIVE to create a healthier indoor climate! Complete your VELUX skylights with a VELUX blind. VELUX blinds offer effective sun screening and heat protection to suit your every need.